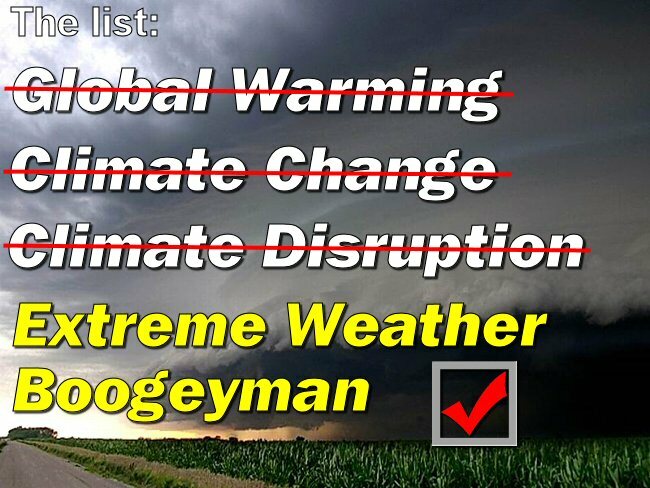 Now, alarmists are making the public believe in the extreme weather boogeyman | Watts Up With That? A new survey has been released by Yale in cooperation with George Mason University. In it, 74% surveyed say “global warming is affecting weather in the United States”. Personally, I blame Seth Borenstein, Kevin Trenberth, Bill McKibben, Joe Romm and Brad Johnson for elevating and continually propagating this lie. As readers may recall, the journal Nature came out with a strong editorial against this sort of thinking, saying it is unsupportable by the current science. Nonetheless, these propagandists are going full steam ahead in pushing it anyway. They are preying on the psychological weakness of short term weather memory coupled with the normal human fear of storms, part of our makeup. Almost everyone has astraphobia (fear of lightning and thunder) to some degree until we are reassured there is nothing to fear. Now, these people are turning that fear back on even though the data shows otherwise. This tactic really isn’t any different than making people in the middle ages believe witches caused bad weather. We think we’ve come so far, yet there are still those propagandists who prey on primal fears for the advantage they bring. • Asked about six recent extreme weather events in the United States, majorities say global warming made each event “worse.” Americans were most likely to connect global warming to the record high temperatures in the summer of 2012 (73%). • Americans increasingly say weather in the U.S. has been getting worse over the past several years (61%, up 9 percentage points since March). • A majority of Southerners (56%) say the weather in their local area has been getting worse over the past few years. Half of Midwesterners (50%) say this as well. • Half of Americans recall unusual weather events in their local area over the past year (52%). • Six in ten Americans (61%) recall unusual weather events occurring elsewhere in the United States in the past year (other than their own local area), perhaps reflecting extensive media attention to the record-setting drought, high temperatures, and strong storms in the summer of 2012, as well as the unusually warm winter of 2011-2012. • Half of Americans (51%) say that droughts have become more common in their local area over the past few decades, an increase of 5 points since last spring. This national change was driven primarily by a major shift of opinions in the Midwest (66%, up 25 points since March), which was hit hardest by the summer drought. • A majority of Americans (58%) say that heat waves have become more common in their local area over the past few decades, up 5 points since March, with especially large increases in the Northeast and Midwest (+12 and +15, respectively). • More than twice as many Midwesterners say they personally experienced an extreme heat wave (83%, up 48 points since March) or drought (81%, up 55 points) in the past year. • Northeasterners are more likely to say they personally experienced an extreme heat wave (52%, up 10 points since March) or drought in the past year (23%, up 6 points). • Southerners who say they personally experienced an extreme heat wave increased to 61 percent, from 50 percent in March. • An increasing number of Americans in the West say they experienced either an extreme heat wave (49%, up 13 points since March) or drought (41%, up 10 points). • One in five Americans (20%) says they suffered harm to their health, property, and/or finances from an extreme heat wave in the past year, a 6 point increase since March. In addition, 15 percent say they suffered harm from a drought in the past year, up 4 points. October 9, 2012 – (New Haven, CT) A new national survey finds that 74 percent of Americans say “global warming is affecting weather in the United States” – up five percentage points since March 2012. Likewise, 73 percent of Americans say that global warming made the record-high temperatures of the summer of 2012 worse, while 61 percent say weather in the U.S. has been getting worse over the past several years, up nine points since March. “Americans have just experienced two years of record-setting extreme weather events, and are increasingly connecting extreme weather in the United States to global warming,” said Dr. Anthony Leiserowitz of Yale University. Half of Americans (52 percent) recall unusual weather events that have occurred in their own local area over the past year, while 61 percent recall unusual weather events that have occurred elsewhere in the U.S. Half of Americans (51 percent) say that droughts have become more common in their local area, an increase of five points since March, 2012. This national change was driven primarily by a major shift of opinions in the Midwest where two out of three respondents said droughts have become more common (66 percent, up 25 points since March). 58 percent of Americans also say heat waves have become more common in their own local area, up five points since this March. In addition, 20 percent of Americans say they personally suffered harm to their health, property, and/or finances from an extreme heat wave in the past year, a six-point increase since March. “Extreme weather is clearly having a serious impact on millions of Americans, though the impacts are different in different parts of the country,” said co-investigator Dr. Edward Maibach at George Mason University. In the Midwest, a large majority (71 percent, up 21 points since March) says extreme weather has caused more harm to crops over the past few decades. In addition, large majorities of Midwesterners say they personally experienced an extreme heat wave (83 percent, up 48 points since March) or drought (81 percent, up 55 points) in the past year. In the South, a majority (56 percent) says the weather in their local area has been getting worse over the past few years, while a majority of Southerners (61 percent) say they personally experienced an extreme heat wave in the past year, up 11 points since March. In the Northeast, 40 percent say that droughts have become more common in their local area (up 15 points since March), while a majority of Northeasterners (52 percent) say they personally experienced an extreme heat wave in the past year, a 10-point increase since March. In the West, 49 percent say that extreme weather is causing more forest fires (up seven points since March). Forty-nine percent of Americans in the West also say they personally experienced an extreme heat wave in the past year (up 13 points since March), or a drought (41 percent, up 10 points). The data are from a nationally representative survey of 1,061 American adults, ages 18 and older, conducted from August 31 – September 12, 2012. Respondents are members of GfK Knowledge Networks’s KnowledgePanel®, an online panel of members recruited using probability-based sampling methods (random digit dial and address-based sampling). Key demographic variables were weighted to match US Census Bureau norms. Margins of error (at the 95 percent confidence level) for the populations discussed are as follows: Total: +/- 3 percentage points; Northeast: +/- 7 percentage points; Midwest: +/- 6 percentage points; South: +/-5 percentage points; West: +/- 6 percentage points. The report: Extreme Weather and Climate Change in the American Mind comes from an ongoing national study, Climate Change in the American Mind, by the Yale Project on Climate Change Communication and the George Mason University Center for Climate Change Communication. The study is funded by the Surdna Foundation, the 11th Hour Project and the Grantham Foundation. In addition to Dr. Leiserowitz, principal investigators included Geoff Feinberg and Peter Howe of Yale University and Drs. Edward Maibach and Connie Roser-Renouf of George Mason University. I think Pielke Jr put the lie to this story using good old fashion data to show extreme weather is in decline. On a more serious note, this all shows how alarmists feed on fear, and quite literally, on dead people. Zombies around us. The boy who cried wolf is now the boy who cried Wolf! Panther! Bear! Cougar! How long will the villagers put up with it? So Global warming morphed to Climate Change which has now evolved into Extreme Weather. The lies have to get bigger and bigger, the little boys have to scream “Wolf! “Wolf!” louder and longer, but when their grift finally collapses it will be a total and complete end to the Great Con Job. And they know it. Which explain their ever more desperate claims and fear mongering hysteria. This is devolving into Newspeak. We have always–or never–been at war with Eastasia…. Just watched Bill Mckibben on the Bill Maher show: we’re going to lose Ohio (for argricultural purposes), storms are getting worse and invoking the precautionary principle all in about 4 minutes. This is actually very good news for skeptics. Climate Change is such a ill defined phrase that everything is climate change. You can’t argue against actual climate change because the climate is always changing. Now, it they move to extreme weather, then we’ve won. Tornadoes, hurricanes, droughts, floods, ….. none of them show any real positive trends. These things, while some are still vague, are more measurable. We are aware of their statistical acrobatics and can spot them fairly easy. A majority of Americans (58%) say that heat waves have become more common in their local area over the past few decades, up 5 points since March, with especially large increases in the Northeast and Midwest (+12 and +15, respectively). In other words, a single heat wave over a period of a few weeks caused a change in people’s perception of how common heat waves have been over the last few decades. There lies the difference between perception and facts, which is why we started keeping records in the first place. It has never been any different. The rest of the survey is just more of the same. I know of no one who would reply or respond to a survey such as this. A very basic question: Who does? The survey questions are not only loaded, but also of trivial merit. After a hot summer, with drought conditions over much of the country, a September survey is likely to show that more people think it has been getting hotter or dryer in recent years, than one taken in March before the onset of these conditions. Public opinion often has no connection to fact, because it is possible to fool some of the people some of the time, especially when this kind of flimsy work will be waved about by the MSM to give a needed boost to the bogus bandwagon of the climate alarmists, and its huge train of misguided zealots embarked on a kind of self-righteous green crusade, shepherded by the various watermelon celebrities, organizations, and tyrants, and not likely to give up easily on their imagined quest to save the world. Nevertheless, the CAGW bandwagon is getting a bit wobbly on its wheels, and a couple have been completely shot off. The mob in train will have to work a little harder now to keep the whole scam going, and Dr. Leiserowitz’s survey will be fodder for the green horde. I recently talked to someone that says the climate is worse because this person couldn’t remember getting sunburned as a kid back in the ’80s, but regularly gets sunburned now. Strange, because I can remember back when I was a kid back in the ’60s getting sunburned every summer. I and my friends would all get sunburned. We even had competitions to see who could pull the biggest piece of dead skin off in one piece. Looking back; I remember tornadoes, blizzards, heatwaves, cold waves, hail storms, heavy snow winters, light snow winters, droughts, warm winters, frigid winters, hot summers, cool summers, etc. In short, I see nothing different now from when I was a kid. Are these people in the pols so stupid that they believe what their told over what they lived? Hands up! Who remembers the thirties? Not bogeyman, but could this be more like; “Bogus, man”? I was just thinking the same thing myself Bob. Interesting how ALL the hysterical warmists are going for the disaster angle, as they have given up on the “ICE” disaster as that didn’t happen and the seas that did not rise to their liking. So what is left except more hysterics about the weather. Can anyone remember precisely what last year’s weather was like. Have a guess, write it down and then get the facts and see how one fares. Alex Jones is the same nut who on Dec 31 1999 was broadcasting ‘the collapse of the world’ ALA Orsen Wells “War of the Worlds” style (but Alex carried on as it was *real* to him! versus with Wells it was a ‘show’, a put-on) … but of course, none of what Alex Jones portrayed as occurring was true. Sorry James – that doesn’t work, facts can – but ingrained perceptions are not easy to change with facts. Back in 1976 in UK there was a long and severe drought – unlike the one in 2012 (“the wettest drought in living memory”) the ’76 drought only ended late summer when the government appointed a ‘Minister for Drought’ and it started raining. However, late that summer there were several domestic gas explosions. The press started attacking the gas companies for not maintaining their pipework and householders were warned repeatedly that subsidence due to dry weather was causing the older pipes to fracture leading to leaks and explosions. Domestic gas explosions seemed to be front page news almost every other day. Eventually, a more attacking interviewer on one of the more serious TV news analysis programs started a combative interview with a senior executive of what was then ‘the Gas Board’. He demanded to be told what the Gas Board was doing about the subsidence causing the large increase in domestic gas explosions and loss of life. The senior executive dryly responded that in reality for the year of 1976 and for each month – gas explosions were far lower than normal. The reason that they made headlines was because they made headlines the first explosion being reported on a slow news day in late summer, triggered interest and the news became self fulfilling. We have the same psychology here – the ‘if you repeat a lie often enough people will start believing it’ (tm Goebels). Removing the public perception that the drought had caused gas explosions was not achieved by giving them the facts. More by lack of interest – as the headlines no longer sold papers different fads and nine-day wonders took over and the explosions dropped out of sight. What we see with the alarmists is a continual battle to retain the headlines – so they move to more and more extreme positions. But showing they are wrong with facts won’t work. Perhaps get the media to start reporting alarmist twaddle – as alarmist twaddle just geared to get more tax money…. that would kill the perception stone dead overnight. In the 50s my grandfather used to blame the crazy weather on the Russians. I suppose others once thought it was Zeus or something else manipulating weather. There has always been a weather bogeyman. ‘Extreme weather and climate change in the American mind’. That sounds about right, most of it is in the mind. Con men make a living by preying on human nature. It is human nature to look for the “tiger in the grass” or analyze noise data and see patterns. In addition, we tend to remember 3 sigma events more than those closer to the means, so when the outlying points in the distribution occur, they tend to count those higher in our minds. I think ‘extreme’ has been devalued. Everything is ‘extreme’ now. whether it rained last Tuesday. Can never be too accurate measuring sheer ignorance, you know. Overall, the fact that this many people believe something patently untrue says a lot about the media in this country. As you can see, freedom of speech does not guarantee that truth will out. Media folks are either unwilling, or afraid to cover the subject with any competence. You can always take the view that we already knew the public to be woefully ignorant about a whole lot of things, especially when it involves science (they still believe you catch a cold by getting chilled or wet, something disproved in the 1920’s). weather events. Or did the respondents know what the difference was between this heat wave and past heat waves? .Or past droughts? The fact that the survey was done by an organization out to prove climate change makes it suspect, as well. I’m sure that if there had been a lot of hurricanes lately, the emphasis would have been on them. Is this some attempt at subliminal html? Two obvious things everyone overlooks. People stay inside more. They aren’t out in the weather so the few times they are they are surprised by what the weather is doing. They don’t know how to prepare for the weather so it seems to them that it affects them more. The other issue is the land use changes man has made. Over up a bunch of land with buildings, concrete and asphalt and any rain appears worse since there is more run off. Shoddy construction also means that it doesn’t take much wind or weather to tear things up. Some five year old houses near me are already having their wooden fences leaning over and falling down because they weren’t put up properly. A third potential factor is people don’t stay in the same area, they move around. They have no history, no memories of what weather has been like where they move. So it seems worse just because it is different to them. Basically people don’t have any common sense anymore. Extreme weather plastered all over the cover of the National Geographic magazine’s September issue. In the fifties it was the atom bomb tests. Before that comets. Now it’s CO2. Better sensors, larger populations, and video camera phones make it easy for these people to scam the naive. The fox is getting chicken little to do his dirtywork for him. The most extreme weather “event” I have EVER experienced (in 57 years) occurred Oct 31-Nov 4, 1991. I didn’t blame anthropogenic CO2 on that weather event then, and I don’t blame it now for the (drop in) extreme weather events today. This weather occurred in eastern/northeastern Minnesota, and was caused largely by the much more hyped “Perfect Storm” off the northeast US and maritime Canada, essentially halting the eastern movement of all other weather patterns. In Minnesota, we called it the “Halloween Blizzard,” not Athena or some other such rubbish. Started snowing about 2 PM on Oct 31, by the time my young children went out trick-or-treating, there was about 5-6 inches on the ground. Halloween this year began on a Thursday. Friday was the only day in 11 years I spent in MN where snow kept me from going to work. Will spare you the blow-by-blow, but by Sunday morning it was still snowing, and we had received 45 inches of snow. My wife had to pull a double shift at the local pulp and paper mill, then went back in to sub for another employee who couldn’t get in, riding a snow machine the last mile or so to the mill. Monday morning, Nov 4 when I arrived at work, the temperature had dropped to -20F, after the cold front that had been sitting on top of us for 3+ days finally moved on. Less than 50 miles either side of the center line of the cold front there was ZERO snow. We had been in the bullseye for more than 3 days. It was weather, unusual to be sure, but just weather. quote: In the South, a majority (56 percent) says the weather in their local area has been getting worse over the past few years, while a majority of Southerners (61 percent) say they personally experienced an extreme heat wave in the past year, up 11 points since March. They must live in Texas. In South Carolina this past summer was pleasant compared to the one before, and we had plenty of rain. Then again, maybe they consider rain bad? A few years back we had about two months without a drop. That was bad. This tactic really isn’t any different than making people in the middle ages believe witches caused bad weather. – In the Middle Ages only a very few experts who could interpret the truth. Then it interpreting a Bible in latin. Now it is climate models and temperature data that we need the learned interpreters. – In the Middle Ages anyone who questioned that truth was a heretic, and declared under the spell of evil spirits. Not much difference there either. about how hot the rest of the year could be expected to be. suggests that if the first half of the year is hot, the last part will be cold. degrees/century. Most months had positive slopes with July the greatest @ 1.675.
of our climate chefs have had a chance to cook those books yet. last full month. The bottom row is the the value for averaging the years that were hotter. but in 1967 to 1969 we had 23 consecutive months of temperatures below the long term average. Looking at annual averages, we were above average for 10 consecutive years ending in 2007, but we were below average for 11 consecutive years ending in 1976.
that would be very unusual weather. Sorry about the formatting. I naively expected it to look like what it did in the entry box. As I pointed out in a February American Thinker article http://tinyurl.com/847nsq2 and in WUWT comments http://bit.ly/PlVjhQ , all paths lead to Gelbspan. Climate Scientists are not merely fighting for their livlihoods. In a sense they are fighting for their lives, for there is sure to be a back-lash, especially in Europe where the climate fraud has resulted in a completely stupid derangement of the entire economy. People will be looking for a scapegoat. Climate Scientists who have gone whole hog for the fraud, (as opposed to the few who, I suppose, have remained honest and unaffected by all the loot, luxury and fame flying about,) are like famous ballplayers past their prime. Time to get off the field, fellows. You are embarrassing eveyone. Of course, “Global Cooling” should precede “Global Warming” on the list. And that term was preceded by some other alarmist fad used to exploit the exploitable. It may seem a small point, but to attribute anything with this kind of certainty from such a small sample, less than 1100 people, smacks to me of making the answer fit a preconceived opinion. I wonder how this tracks across different age groups. Just look at the education our kids are getting in school and you’ll see the more recently they were in school, the more likely they are to believe this. Lying is not only a sign of poor character, it is also a sign of desperation. SUMMARY – TEMPERATURE: The balance of probabilities suggests that September will be slightly warmer than average. It will therefore have come as no surprise that September in the UK turned out much colder than normal, in fact 0.7C colder than the 1981-2010 baseline, and the coolest since 1994. Still, maybe they fared better with their rainfall forecast. SUMMARY – PRECIPITATION: For UK averaged rainfall the predicted probabilities weakly favour below normal values during September. Woops! Rainfall was 17% above normal! At least use a different font or highlight your text, Anthony and moderators, this is a simple fix of the comments which needs attention still. As far as this article goes, it shows how far you can bet on the stupidity of the American public! The survey measures how effectively the alarmist message is being accepted within the general population and relies heavily on the ‘recency effect’ of associating weather variations within the last few years with the alarmist message of ‘anthropogenic climate change’. about as scientific a survey as a lewandowsky! While these fear-mongering tactics are deplorable, in the the end, they’re just building evidence against themselves for prosecution. Chronicle of an announced death, Wikipedia style. I had not posted on this road movie for a while but the occasion is too good to resist. In the Wikipedia world there are crimes that deserve harsh punishment. Yet those appear magnified when “the Cause” could be threatened by the presence of “Global Warming Deniers” in the vicinity of Climate Change greatness. But living scientists too should be on the lookout for Connolley’s grim ripping endeavour! Professor Gerhard Kramm is about to experience it first hand if Connolley and Eli Rabett get their way. Check Eli & W’s dialogue on the Connolley’s STOAT blog link above. In Wikipedia vocabulary this is called “canvassing” and quoting from one of Connolley’s “friendlies” admonishing a much too vocal pro-Leroux editor about the crime: “…off-wiki canvassing of the worst type (canvassing people of a specific viewpoint in order to stack a discussion).” Repent sinner! Yet when it comes to Wikipedia royalty Dr. William M. Connolley, all is clear. So clear, they did not bother to sub-contract rolling the ball against Kramm two days after WMC asked him to “Well don’t just complain about it, do something about it! –W”? And the boys are following the same, true and proven script than for the Leroux deletion, starting by questioning the victim’s “notability” and stacking up the deck against the poor professor’s unorthodox position on Climate Change during a likely one sided discussion. Who will be expurgated next? If history repeats itself, let’s recall that Robespierre too was guillotined and with him, “his brother Augustin, Couthon, Saint-Just, Hanriot and twelve other followers, among them the cobbler Simon, were also executed”. It must be true: it is in Wikipedia! The only weather weirding going on is the tactics of those who stand to profit from CAGW in one way or another. First they say we should all ignore anyone who isn’t a bonafide “climate scientist”. (They get to define who they are.) Now they present polls of non-“climate scientist” as proof on CAGW. Weird. Here in central Ohio of the top 10 record highs only one occured after 1950. Of the top 10 record lows six were after 1950. Someone mentioned archived records. I know that some records have been “adjusted”. The internet makes it easier to get away with that. Look up the records for your area and the only numbers you see are the most recent “adjusted” ones. Of course you can copy/paste them into a program on your PC every few years to see what’s been changed. I’d advise that. But there are also records in print. (Remember, books?) Perhaps some of you with more time and skills than I do should scan some of those records for your area? Young people tend to think the weather is much worse than normal recently. Old people on the other hand will usually tell you that the weather was much worse when they were young. Does this also mean they believe Humans are the cause of all the beautiful storm free days that are free from extreme weather events? Extreme weather events are the exception that’s why they are called ‘extreme’. Sure, there are extreme events happening everyday somewhere at any time around the planet, but favorable weather outnumbers extreme weather, Human activity can create a clear blue sky no more than it can cause a tornado or even a hurricane, How about Snowstorms and freezing cold temperatures that leave lakes and rivers frozen with ice during a harsh winter? is this believed to be the cause of human activity too? Why stop there! how about the rise and fall of oceans? El Niño/La Niña? Arctic Sea ice variability, Antarctic Record Ice growth, wind speed, moister levels, heavy rains and floods, Ozone variability, frequency and intensity of Aurora? frost, fog and the size of hail stones? I call BS, I think for an oxygen and nitrogen based atmosphere with a trace amount of CO2 already present in it (since it was formed), Human activity in reality does not effect the planet on the massive scales suggested by these CO2 based climate change cults, I’m actually quite disturbed and shocked that so many people have been persuaded of this political masquerade of science (who, I’m sure are very honest and normal hard working people). The simple act of the orchestrated suppression of scientific opinions say’s a lot in it’s self, it really is over and above the norm for any other scientific theory. Lately I’ve also become extremely annoyed with the British MET Office and their awesome disregard of the public’s opinion on their spectacular failures lately, and I have become very disillusioned with the standard of reporting in the media who appear to have taken up a role of being outlets of repetitious nonsense of a one-sided debate, instead of objectively reporting the honest arguments from all sides. But why should anyone listen to what I have to say? I’m not a climate scientist! I may as well burn all my hard earned qualifications, experience and knowledge gained through years of study and practice to conform and believe in a hypothesis that I have not once seen any hard facts about, convince me!. Well, I wont be doing that anytime soon, to me it would be like drinking punch laced with poison handed out by a cult leader. October 9, 2012 – (New Haven, CT) A new national survey finds that 26 percent of Americans say “global warming is a load of bull”, and have refused to drink the kool-aid. Teams of marauders have been seen, bearing pitchforks and flaming torches made with hockey sticks, seeking out the non-believers. /sarc – as if it’s needed. Back in the late ’60s I witnessed a really heavy rainstorm. The quadrangle of the school I attended was flooded in minutes. If I was 18 then, I would probably have said it was unprecedented, it certainly was for me aged about 15. A couple of years ago, there was a similar rainstorm where I live now, about 12 miles from where I lived then. 40ish years later. a 30 year old would probably say it was unprecedented, it wasn’t for me being nearly 60. I happened to attend a seminar by professional alarmist Dr Paul Williams, University of Reading, UK, at the Aspen Center for Physics last June. He said that their group’s new climate models now included stochastic variability in addition to long-term trends, and added that one the main advantages of including that variability was that it allowed them to predict more extreme weather events for the future, “which is what the public is really concerned about, not average trends”. So I guess that’s really the new battle front. In fact, I am surprised it took them so long to jump onto this argument. Doomsday preachers of every other religious cult in history have always resorted to that strategy for thousands of years. At this point it is just for their power and glory. Truth left the scene a long time ago for these guys. That Bob Hope clip had me buckled over in stitches. I tried this out on some friends and nobody caught my double meaning and thought it amusing. The trick is that “determine” can have two diametrically opposite meanings. I think we all know why it wasn’t? After all the propaganda, all the tax money spent and it’s up 5 points. That’s not much bang for our tax buck. After our long, hot, forest fire summer it should be 97%. Maybe they need to cull the herd. Ask more experts. How many lights do YOU see? How many storms do YOU see? The extremists are entering the frenetic stage one can expect as their fantasies die . Reminds me of 50 years ago mapping geology by canoe and compass traverses for the Manitoba Geological Survey. At noon, we stopped and boiled up tea – the water often the colour of tea already, coming from a bog if your farthest traverse point didn’t have a lake or river to scoop from (a few times the water was bailed out of moose tracks). The pond bugs in the water would begin to swim faster and faster and allign themselves in patterns outlining cooler regions of the heating water until they finally expired. The tea was added, allowed to flip over a few times and then taken off to cool. Fitting that extremists are now desperately clutching at extremes whirling faster and faster at the end of it all. They have nothing else left. The world is not warming, the seas are not rising – even with added GIA adjustment, the ice is not melting at both poles, whilst the Arctic has record lows the Antarctic has record highs, so what do they have left to sound alarm? This is pushing them even further away from science, but did the zealots ever cared for science? It is catching with the masses and will be in vogue for maybe 1 year, then they need to come with something new, earthquakes caused by CO2 maybe? Or ozone holes? This exercise is at prime time for a group of senior USA respecteds to write a letter to the current President, saying that extreme weather is a forecast that does not match past data. The President should make it clear to the people that he has seen the figures for the frequency of severe storms, earthquakes, drought, whatever (as provided with the letter) and that he is satisfied that American people can rest easy, knowing that such climate change as there is merely poor science dressed as propaganda when it predicts an increased frequency of severe weather events. I can’t imagine a better time for this tactic.